If you want to experience the full-blown fun of a NASCAR race, there’s only one way to do it, by RV. RVing and NASCAR have gone hand-in-hand long before the days of restrictor plates and road races and still maintain a tight relationship to this day. The easiest way to have a good time RVing to a NASCAR event is to be prepared and what better track to RV to than arguably the granddaddy of them all, the Daytona International Speedway. Let’s get you set up for RVing to Daytona with places to stay at the track, places to stay near the track, a little history of the track itself as well as some tips and tricks. You’ll be ready to “turn ‘em loose” on a Daytona RVing adventure. The track you know and love was not the first version of Daytona you see today. The first NASCAR affiliated races took place on Daytona Beach and not on an actual track. Daytona International Speedway as we know it broke ground in 1957 and opened two years later in 1959. The track has undergone numerous changes over its years and has been used as a road course, dirt track and more. 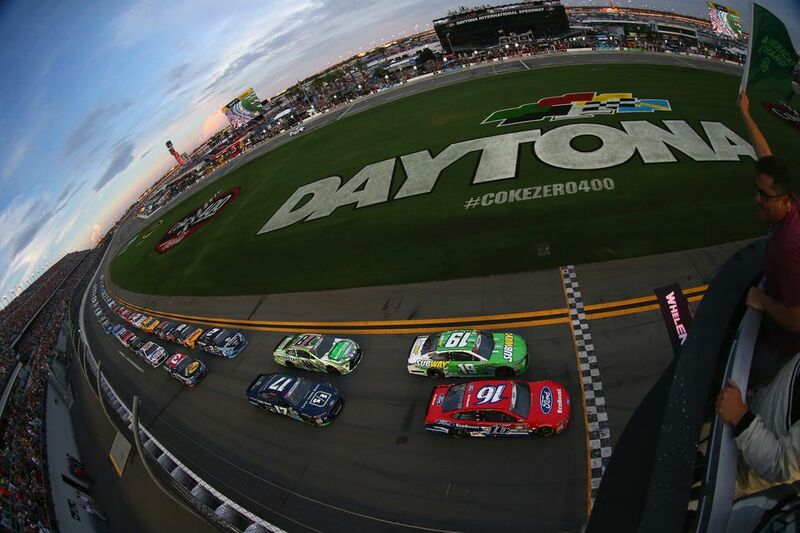 Today, Daytona is known for its 2.5-mile tri-oval configuration which hosts several NASCAR sanctioned events. There are several options available should you choose to RV to the actual track itself. There are too many options all to be listed but here are some examples of different site types. These are a few of the varied sites available for RV camping right at the track. There are additional items with these sites such as wristbands to events and car passes, depending on the site. Perfect if you want the true NASCAR infield camping experience, but these sites are a bit costly. Reserve early if you want to get a site. For a full list of available site types at Daytona International Speedway, please visit Daytona’s RV camping information page. Infield RV camping is not for everyone. Many RVers would much rather grab a nearby site to get to the race. For those RVers, here are a couple of great nearby RV parks. International RV Park and Campground is about as close as you can get without being in the infield. Full utility hookup RV sites, some sites come with cable hookups, and all sites have some degree of Wi-Fi access. You get the basic RV ground amenities such as laundry, restrooms, and showers in addition to a general store, clubhouse, rec hall and exercise room, group picnic areas, heated pools, and garbage pickup. International RV Park also provides bus service to the track during events so that you can leave your RV behind. Ten minutes from the raceway, you’ll get to enjoy all the festivities race weekend has to offer with little travel time by staying here. The Daytona/Speedway KOA is near all the action. Like many KOAs there are a variety of site types, but regardless of choice, you will get full utility hookups on top of cable TV access. You can trust that the bathrooms, showers, and laundry will be clean, and there are some other amenities outside the basics such as a camp store, propane refills, and dog areas. Be sure to book early if you plan on coming down to this KOA for a race weekend. This KOA is five minutes from Daytona International Speedway; you can walk from your RV site to the races. Daytona Beach RV Park is an all-ages RV resort is perfect for NASCAR fans who want to experience more of Florida's sunshine. Whether you're hitting every race over the weekend and want to chill in between, this resort is perfect for families, solo travelers, and more. With 230 full hookup sites, karaoke, shuffleboard, a wading pool, you'll never be bored waiting to cheer on your favorite drivers. About a ten minute drive from the speedway, you’ll be at the track before you know it. Be prepared for any weather. Daytona Beach can undergo drastic weather changes so be prepared for rain and even severe thunderstorms. It can get surprisingly cool as well even in Florida, bring a light jacket at the least. If you’re attending the race, make sure any coolers or other items such as purses meet track regulations. Wear plenty of sunscreen, even if it seems cool out, the UV rays are still there. If you’re parking near the speedway, try the east side. Traffic coming out of the east side of the track is typically less congested. For a full list of NASCAR related events at Daytona International Speedway, please visit NASCAR’s event page.